It cost a small fortune to make this marinade, but it was completely worth it! (I only wish that I had put more chicken in it!!) When I saw Mario Batali make this Caribbean meal on The Chew, I wanted to make it and pulled up the recipe immediately. SOooo many delicious flavors. This recipe was adapted from The Chew, contributed by Mario Batali. I increased the amount of chicken, used skinless chicken thighs, and incorporated whole wheat flour in the roti. The amount of spicy pineapple sauce in this recipe could easily be cut in half. (& I am a HUGE sauce person!) Any leftovers would be tasty eaten as a salsa with tortilla chips. The chicken did develop a nice char in the oven, but this would be an amazing dish to grill in the summer!! (It has to warm up soon…) I’m bringing this meal to share at Fiesta Friday #61 at Fiesta Friday.net. (Yes! a new home for the party & for Angie of The Novice Gardener.) Enjoy!! For the Marinade: In a large bowl, combine all the ingredients for the marinade. Preheat oven to 450°F or light your grill with one side hot, one side low. Remove the chicken from the marinade and discard the marinade. Season with salt and pepper. Place on a baking sheet and roast for 40 minutes; it should get a little char on the top (we like that). If using a grill, place the chicken on the hot side of the grill and cook until nicely charred on both sides, then move to the cooler side and cook with the lid down until cooked through. Serve hot, with pineapple ketchup and warm roti alongside. Place all the ingredients in a food processor and pulse until smooth. If not using immediately, store in a sealed container in the refrigerator for up to 1 week. Combine the dry ingredients in a stand mixer fitted with the dough hook. Turn the mixer on and gradually add the oil and water while mixing, then mix for 5 minutes. Remove the dough from the mixer and let rest for 10 minutes. Divide the dough into 8 equal balls. Flatten each slightly and roll out into 6-inch rounds. Heat a cast-iron skillet over high heat until a drop of water sizzles on the surface. Reduce the heat to medium and place the rotis in the pan, 2 at a time, and cook for 2 to 3 minutes, until the crust is light brown. Turn with a wide spatula or tongs and cook for 1 minute on the other side. Repeat with the remaining dough and keep warm in a bowl, covered with a clean dish towel. Use the same marinade for pork or fish. Buy pre-made roti or pitas for a quicker dinner. 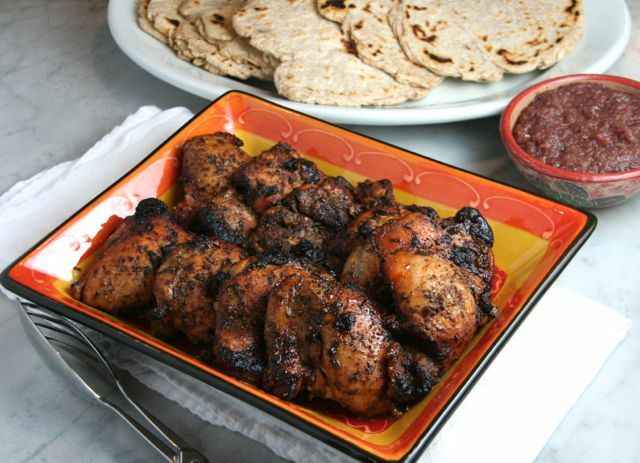 I do love jerk chicken, and this recipe with the tasty sides looks great. I agree would be great on the BBQ – we’ll get to that weather some day! I wouldn’t have thought of the vanilla, interesting mix. I bet this is amazing on the grill. I just trust Mario Batali- it was an amazing combination!! Really tempting. Would love to try this delicious chicken. Try it!! The chicken was really amazing. It was worth EVERY cent. I would just completely load it up with chicken next time! Goodness, does that chicken look amazing!! Love all the flavors and components in this meal Josette!! Thank you, Naina! The chicken really would be amazing on its own- but it was a nice meal altogether. Josette, the chicken looks fantastic and yes, it does have to warm up and I can just imagine how amazing this would be on the grill! Thanks so much for sharing this with us – Happy Fiesta Friday! Thank you so much, Selma! Happy belated FF!! Yay!! Happy to hear it!! Let me know what you think. I hope you enjoy it as much as I’ve enjoyed your Greek Red Lentil Soup -made it twice already! I lernt about this recipe one year ago, I guess. I know that I should make it soon… it sounds a divine combination of flavours! Thanks for being at FF, always a good pleasure! You do need to make it soon- it’s a nice change of pace. 🙂 Thanks for hosting FF this week! Ooh, I haven’t had jerk chicken in ages. Your recipe sounds so good, Josette! I am a huge jerk chicken fan and this sounds delicious. The vanilla threw me a bit though! That spicy pineapple sauce though – I bet it put it right over the top! Oh my god. I’m make this on the 4th of July! Incredible! I don’t like the chew, but maybe i should start watching!! !